So, this upcoming weekend is all about college football. The season kicks off with all the pride, pageantry and running up the score that is the many scheduled FBS vs. FCS contests (for the uninitiated, the opening weekend schedule is usually dotted with many upper division vs. lower division contests, with the lower division schools playing patsies to the big boys in exchange for a big check. Also known as a “guarantee game”, in that the lower division team picks up guaranteed money, but it’s jokingly referenced as a guaranteed win for the bigger program, though, a few times David has slayed Goliath in these games). 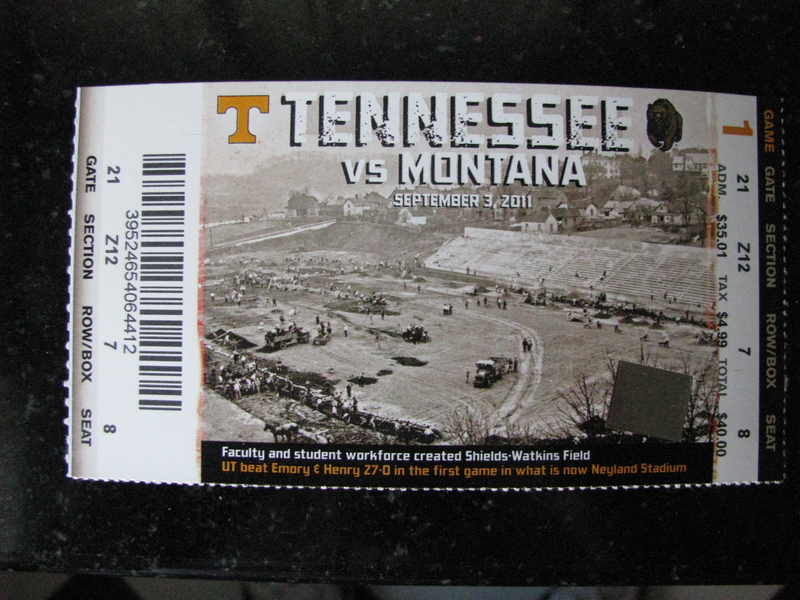 One such game this week will pit perennial FCS (Division I-AA) power Montana and perennial FBS (Division I-A) Top 25 member Tennessee. In my four years of helping to cover the Montana Grizzlies (and Montana State Bobcats) for the Billings Gazette’s Cat-Griz Insider, I’d never actually BEEN to a Grizzlies game. I don’t consider my lack of attendance at Washington-Grizzly Stadium to be a barometer of my ability to cover the team. Beat writer Greg Rachac traveled to (most) home games and I had to stay back at the office to cover local sports results that poured in to the newsroom. I watched the games, got plenty of stats and read through my share of reports. I was a heckuva armchair quarterback if I say so myself. So when I saw the Grizzlies were opening this season at gargantuan Neyland Stadium in Knoxville, Tennessee, I just had to go. I, for one, have always been a fan of these guarantee games, hoping against hope that the mighty fall. I remember when Montana State toppled Colorado in 2006 and of course who can forget Appalachian State handling No. 5 Michigan at the big house the following season, arguable the greatest upset in college football history. I feel that these games give the lower level schools more than just a chance to be thrashed. IF (a big “if”, of course) they win, they’ll take a program-defining result home with them. It will be something every player, coach, alumn and fan will remember for the rest of their lives. Even more importantly, it will give them a huge leg up on the playoff selection in the lower FCS division. Oh, and let’s not forget. Tennessee, welcome to my 50 states checklist. You’ll check in at No. 32 for me.